People on the tagging list discuss the use of an alternative to mailing lists and wiki. User jonwit is looking for a way to map minefields. So far, there is no well-established/documented tag. Mapillary give some initial feedback for traffic sign recognition. Simon Poole describes in his diary the journey to pick-up a server donation and his experiences with OsmAnd and Mapillary. User mmd asks for help to supplement the Overpass sample collection. He is looking for translators for the new page Overpass API/Overpass API by Example. mmd states on demand that this is important because students will create a learning platform for the Overpass API in “Google Summer of Code” and they should be able to use it. How important is voting on new OSM tags? Opinions … differ. Colin Broderick describes how one can see the mapping progress in Lesotho with a “punch card”. Pascal Neis shows an overview of recent changeset discussions. In the future, more opportunities for discussion should be added. In Borno, a state in north-eastern Nigeria, there will be an import of healthcare facilities. An import of railway data in the Netherlands has been discussed on the Dutch mailing list and in the forum. Frederik is among the people with objections. The OSMF Board is considering setting up a support force for the board. Frederik asks on the OSMF talk list if anyone has experience in organisations with such a support. The question triggers an extended discussion. In the course of discussions Frederik gives a brief insight into the functions and activities of the board. Paul Norman published a first draft of the meeting on 16th February 2015 in Berlin. On April 18, will be held the annual general meeting of the Swiss Association OpenStreetMap (OSM Switzerland) in Biel. The OSM administrator Firefishy is looking at options for new digital certificates for the various OSM websites. Intermediate result SotM US: More than 230 applications for funding were made and more than 200 talk proposals were submitted. In Vienna there will be an open source camp under the auspices of Netidee on 15 and 16 May 2015. OSM may use the current aerial photographs of Vanuatu from Airbus D & S. The images are available as a TMS, but have an offset to OSM and Bing. PierZen and Severin Menard are candidates for the HOT Board. Some before/after images show the destructive force of the cyclone Pam, which devastated the island nation of Vanuatu. 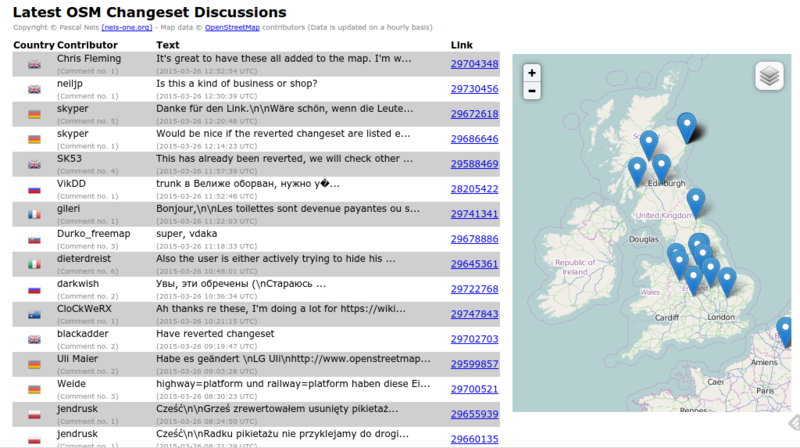 The default map style to OSM.org has been updated to version 2.29.0. Details of the changes can be found here. Current Landsat satellite images are now available via Amazon’s AWS cloud service. The beta testing of the newly developed navigation program Terra! has begun. Interested parties with iOS 8.1 or above devices can register here. The command-line tool geotool converts raw geographical data into ASCII art. The first applications for the OSM projects for the Google Summer of Code arrive – and questions of the candidates to the projects as well. … the website from Walter Nordmann that displays borders? Dane Springmeyer from MapBox reports about “Mapbox Vector Tile Specification by Esri”. Landsat satellite images can now be virtually displayed quasi in real time on the services of MapBox (MapBox Studio).